Embrace the Future. "Be the change that you want to see in the World". There are so many terrible things happening in the World that we cannot control, but there are also great challenges right in front of us that we can have a great positive impact on. We can personally make a difference by focusing on the problem areas that we see every day in all of our communities; homeless and disabled Veterans, abused children and women, animals languishing in shelters with no home, countless problems with no funding available to address them properly. NOW THERE IS A SOLUTION RIGHT IN FRONT OF US FOR EACH AND EVERY ONE OF THESE SOCIAL PROBLEMS. AND THE ANSWER IS..... SOCIAL ENTERPRISE. IT IS TIME TO DEPEND ON OURSELVES. As a community we can solve each of these problems by spending the dollars we are going to spend anyway with people and businesses who support the Nonprofits in the communities they serve. This is Social Enterprise. The Fact is that if even a small percent of business done in your community was done with people and businesses who gladly Give Back part of their income or commission to Nonprofits.......these numbers DWARF the combined donations of the government, philanthropists, and corporations. Imagine if this concept becomes a significant part of how we do business. Well, the MBA programs in our leading universities are teaching that Social Enterprise is at the beginning of a trend that will reshape commerce. 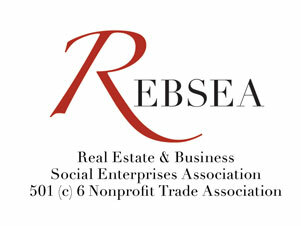 They see themselves as incubators for new models of Social Enterprise and that is exactly what REBSEA is. We are asking you to participate in this process by supporting your local REBSEA Members who donate regularly to the Nonprofits in your community. We are asking you to become a member of REBSEA and be a part of a NEW STORY that can and will solve our social problems. People prefer to do business with people and businesses who Give Back. Let's give the public the opportunity to do so. For information about REBSEA visit REBSEAor call 855 352 4973.